Jan van Tuyl takes a deeper look at the bible’s timeline. In his new book, “A New Chronology for Old Testament Times: With Solutions to Many Hitherto Unsolved Problems through the Use of Rare Texts” (published by AuthorHouse), author Jan van Tuyl revisits the timeline of the Bible, from the arrival of Adam in this world to the arrival of Jesus Christ. Originally, van Tuyl was intrigued only by the longevity of the people who were born before the Great Flood; however, as his research progressed, he became further interested by the entire B.C. 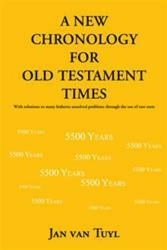 chronology represented in the Bible and in other texts. The book’s special appeal lies in its attention to detail and its many unknown facts about known people, all told in a fast-paced style interspersed with a pinch of humor making the book a very enjoyable read. Jan van Tuyl, a Dutch citizen, started life in Antwerp, Belgium, during the early years of World War II. The author and his siblings had a firm religious upbringing. From a very young age he was intrigued by the Book of Genesis and specifically by the old ages that people lived to during the times before Noah and just after the Flood. After graduation from a renowned business school in Holland, van Tuyl started working for large American corporations, embarking on an international career. First he became managing director in Scandinavia for a privately held U.S. company at the young age of 26, then hired as European sales and marketing manager for one of the divisions of a large U.S. conglomerate. In 1977, he finally realized his dream of starting his own import/export company.